Xavier Stroud, 10, drew an invisible map on the table of a classroom in East Oakland, as he explained his concept of “Born to be Wild,” a virtual reality game where players go on a quest and protect each other from predators in a forest. The fifth grader had never heard of virtual reality before joining the David E. Glover Education & Technology Center, an educational program that provides after-school tutoring in tech skills, including virtual reality development. Virtual reality, or VR, is growing exponentially, with applications in education, gaming, travel, medicine and more. The technology is an immersive three-dimensional, computer-generated environment in which users can interact in 360 degrees. 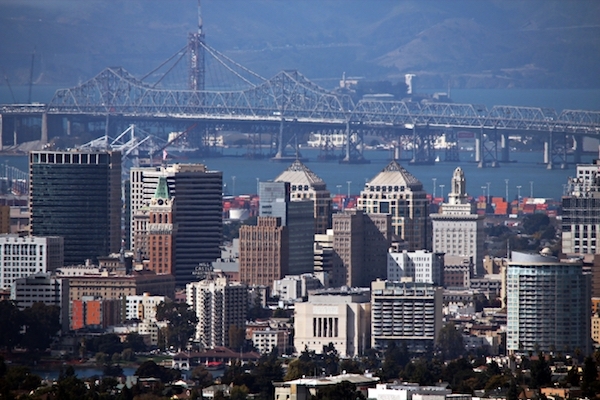 The educational program is part of an effort to put Oakland on the VR technology map. Paul Williams, the youth program director, said that the center was founded in 1997 in an effort to empower Oakland residents with technology skills training. The center had originally been named Eastmont Technology Center, but was renamed three years ago to honor Glover, the late community leader known for his efforts to close the diversity gap in the Bay Area tech scene. Oakland’s education technology needs are considerable because many students come from disadvantaged backgrounds and the public schools are underfunded. According to 2013 federal poverty guidelines, 30 percent of children in Oakland lived in households with income below the federal poverty level. Nearly 35 percent of children lived in households that received public assistance. This makes it a challenge to succeed in the tech sector, in which less than 10 percent of the combined technical workforce at 75 Silicon Valley tech firms are Black or Hispanic, according to the U.S. Equal Employment Opportunity Commission. Building these skills is particularly important as more tech companies move into Oakland, one of the most diverse cities in the U.S. Companies like the music streaming service, Pandora, and the popular photography app, VSCO, are based in the city. Uber is moving downtown in 2017. Williams said he and Darryl Star, the center’s lead instructor and curriculum developer, created a program that complements the new computer science classes taught throughout the Oakland Unified School District. “One of my fundamental beliefs is to impart our love for learning, and build a culture that loves to learn together,” Star said. Star previously worked as a professional game developer—where VR found its first niche—and spent almost five years teaching at a charter school in Oakland before joining the center in the spring of 2015. He brought his enthusiasm for VR to the center. “I think VR could decrease some of the barriers of cognitive learning, especially highly symbolic and exploratory learning,” said Star, adding that students can experiment with abstract concepts in a virtual world. In building the VR program, the program directors said they attended the annual Game Developers Conference in San Francisco where they found partners like Unity Technologies, the developer of Unity, popular software for game development. The company let students use their software and publish the games they created with it. Williams said that simply providing access to the technology could make a difference to the students, many of whom don’t have computers at home. By making students work together as a team in different roles to create a game, the group projects teach students to see the different ways to get involved in science, technology, engineering and math (STEM) careers and find what matches their interests. He said most people only see the coding side of gaming and technology careers, but there are many other kinds of jobs. “There’s designers, there’s artists, there’s storytellers, there’s overall game designers, and there’s project managers,” Williams noted. Sanaa Howell, a 12-year old from East Oakland, said she attended the center’s summer VR program, and it has completely changed her perspective. In the future, Howell said she sees herself as a graphic designer or coder for games. Over the course of an intensive summer program, Howell developed and tested a game where a user can go horseback riding in a virtual world. She is continuing to work on the project through the school year. The center has also taken the students on real-life field trips. They have visited Google’s headquarters in Mountain View and the financial software vendor Workday’s Pleasanton campus, where they were able to see different tech careers in action. Xavier Stroud, 10, of East Oakland uses 3D technology gaming software at the David E. Glover Education and Technology Center. Youth Program Director, Paul Williams, exhibits a VR game in the background. Credit: Stefanie Le.